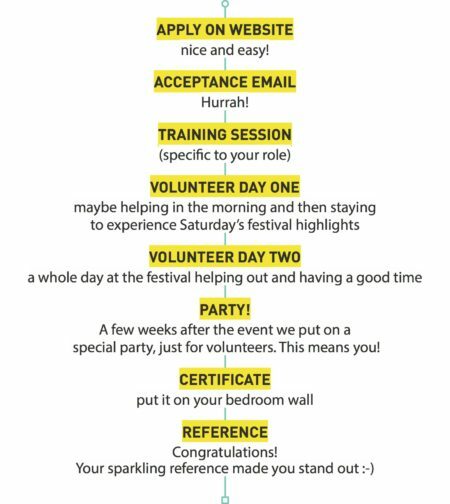 On this page you’ll be able to find out all about volunteering at the National Festival of Making in Blackburn on the 12th & 13th of May. We even have a handy application form right at the bottom of the page. Q: What is the Festival of Making? We take over Blackburn town centre with an explosion of maker and digital technologies, have-a-go workshops, food stalls, international performance, art exhibits, music, food and markets. Last year 100+ volunteers helped us attract 30,000 people visitors and make splash on national television. This year we need your help to put Blackburn on the map with an even bigger, brighter and bolder festival, bringing together Blackburn’s communities for a brilliant celebration of creativity. Q: Why be a Festival Maker? Setup assistance – Moving furniture and equipment, dressing of venues, signage, helping the management team (good for: DIY enthusiasts, event management students) – setup assistance on FRIDAY and SUNDAY. Q: What Will Happen if I Volunteer?